Over the next few weeks, I’m sure as you’ve noticed – I’m getting everyone updated on my summer in the city, in a series titled “An Update”. Today’s post will focus on one of the best days I’ve ever had filled with friends, laughter, glam, and glitz. Aka my birthday. 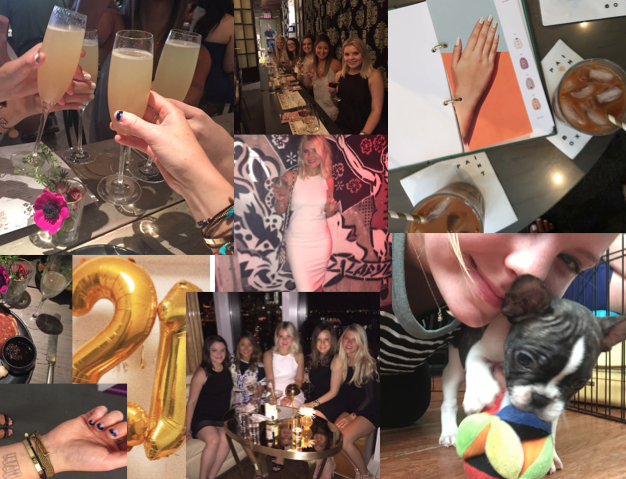 This year’s birthday was kind of big, I ~finally~ turned 21! Since I lived in the city with some good friends, of course we had to make a day of it! Ok, and actually I had been waiting for this day for a long time, so you better believe I was making it the longest day ever. If you haven’t heard of this ultra-cool nail salon in Soho, then seriously check them out. The whole thing is an experience really – you get an incredible mani [they’re known for minimalistic nail art] along with the chance to take a picture of your nails in the mani cam. Can we just talk about how cool that is. If you’re in the city or traveling, this is a spot I HIGHLY recommend. We got a cheese plate for the entire table, and I had the lemon rosemary pancakes. The rosemary mimosa was to. die. for. We enjoyed an hour class on french wines, which were superb. This is a great place to just walk around and look at wines, but of course the staff is extremely knowledgeable, and can point you in any direction determined on your preferences. This was such a fun experience, as none of us had ever actually got a blowout. If you’re not familiar with the term, it’s essentially just getting your hair done – but only the wash and styling. We each got a somewhat different style, which was fun to see in the end! The most highly anticipated event of the day was drinks at The Standard [a popular meatpacking district hotel]. I have quite literally wanted to come here ever since discovering it a few years back, and today was the day. The Boom Boom Room is a lounge at the top of The Standard, which gives incredible views of the city, along with amazing drinks. Oh, and you might run into the likes of Beyonce and JayZ, as they frequent this spot often. Later that night we grabbed dinner in the meatpacking district, along with hitting the other bar at The Standard – Le Bain, which also has incredible city views plus crepes on the rooftop. Too cool for school, right? To top everything off, the next morning we went to a puppy store [mixed feelings about that…] but I got to play with FRENCH BULLDOG PUPPIES. Ok, sorry for the yelling but I was actually in heaven – those who know me, know that I have an [unhealthy] obsession with french bulldogs. Really, it just capped off everything. Overall it really was such a fabulous birthday – definitely one for the books. Sending lots of love to everyone that helped make it so special – my fab friends and awesome parents, I see you! Posted on September 16, 2015 September 16, 2015 by flancake13	This entry was posted in Saturday Shenanigans. and tagged abc, abc cocina, birthday, champaigne, citipups, drybar, elizabeth and james, fashion blogger, french bulldog, frenchie, lebain, ootd, paintbox, paintbox nails, the standard, the top of the standard, twentyone. Bookmark the permalink.